A hash table (hash map) is a data structure used a hash function to compute an index into an array of buckets or slots. A binary tree is a tree data structure in which each node has at most two children, which are referred to as the left child and the right child. A labeled binary tree of size 9 and height 3, with a root node whose value is 2. The above tree is unbalanced and not sorted. The binary search trees (BST), sometimes called ordered or sorted binary trees, are a particular type of binary tree. Binary search tree keep their keys in sorted order, so that lookup and other operation can use the principle of binary search. On average, binary search trees with n nodes have O(log n) height. However, in the worst case, binary search trees can have O(n) height, when the unbalanced tree resembles a linked list (degenerate tree). A binary search tree of size 9 and depth 3, with 8 at the root. The leaves are not drawn. The self-balancing (or height-balanced) binary search tree is any node-based binary search tree that automatically keeps its height (maximal number of levels below the root) small in the face of arbitrary item insertions and deletions. The red–black tree, which is a type of self-balancing binary search tree, was called symmetric binary B-tree. Tree rotations are very common internal operations on self-balancing binary trees to keep perfect or near-to-perfect balance. The B-tree is a generalization of a binary search tree in that a node can have more than two children. Unlike self-balancing binary search trees, the B-tree is optimaized for systems that read and write large blocks of data. B-trees are a good example of a data structure for external memory. It is commonly used in databases and filesystems. 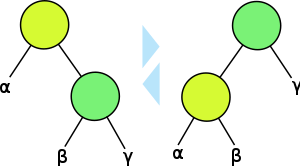 A B+ tree can be viewed as a B-tree in which each node contains only keys (not key-values pairs), and to which an additional level is added at the bottom with linked leaves. The primary value of a B+ tree is in storing data for efficient retrieval in a block-oriented storage context — in particular, filesystems. This is primarily because unlike binary search trees, B+ trees have very high fanout (number of pointers to child nodes in a node, typically on the order of 100 or more), which reduces the number of I/O operations required to find an element in the tree. 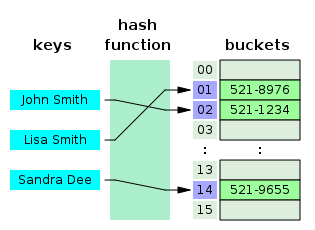 A simple B+ tree example linking the keys 1–7 to data values d1-d7. The linked list (red) allows rapid in-order traversal. This particular tree’s branching factor is b=4. The best way to improve the performance of SELECT operations is to create indexes on one or more of the columns that are tested in the query. An index is a copy of select columns of data from a table. Some databases extend the power of indexing by letting developer create indices on fuctions or expressions. For example, an index could be created on upper(last_name), which would only store the upper case versions of the last_name field in the index. Indexes also add to the cost of inserts, updates, and deletes because each index must be updated. The data is present in arbitrary order, but the logical ordering is specified by the index. The data row may be spread throughout the table regardless of the value of the indexed column or expression. The physical order of the rows is not the same as the index order. The indexed columns are typically non-primary key columns used in JOIN, WHERE, and ORDER BY clauses. There can be more than one non-clustered index on a database table. Clustering alters the data block into certain distinct order to match the index, resulting in the row data being stored in order. Clustered indices can greatly increase overall speed of retrieval, but usually only where the data is accessed sequentially in the same or reverse order of the clustered index, or when a range of items is selected. Only one clustered index can be created on a given database table. The order that the index definition defines the columns in is important. Databases can use multiple-columns indexes for queries that test all the columns in the index, or queries that test just the first column, the first two columns, the first three columns, and so on. A B-tree index can be used for column comparisons in expressions that use the =,>,>=,<,<=, or BETWEEN operators. The index also can be used for LIKE comparisons if the argument to LIKE is a constant string that does not start with a wildcard character. A search using col_name IS NULL employs indexes if col_name is indexed. Any index that does not span all AND levels in the WHERE clause is not used to optimize the query. In other words, to be able to use an index, a prefix of the index must be used in every AND group. They are used only for equality comparisons that use the = or <=> operators (but are very fast). They are not used for comparison operators such as < that find a range of values. Systems that rely on this type of single-value lookup are known as “key-value stores”. What data structure does mysql use to store data?